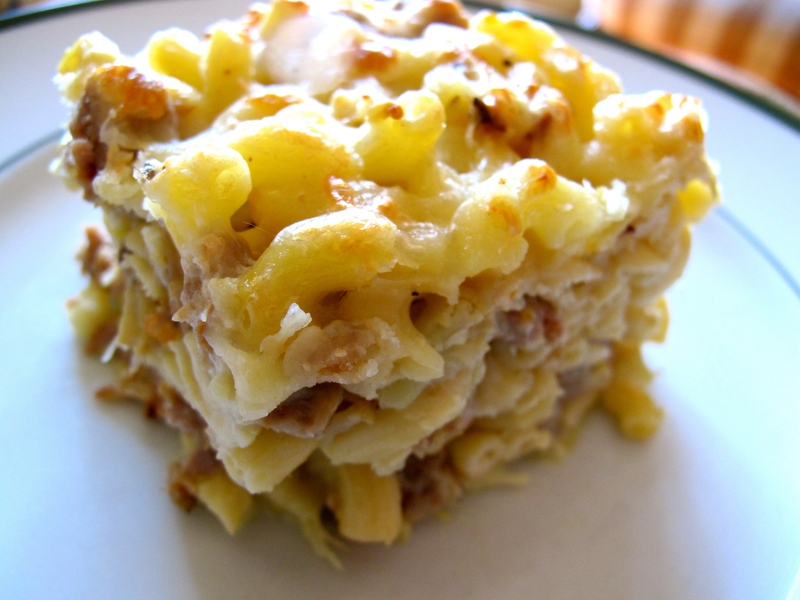 There is almost nothing like a good macaroni and cheese, but it’s a very decadent dish that often needs to be rationed out like chocolate cake. I say no to that madness! Instead of limiting my mac and cheese intake, I make it more healthy. This delicious dish is great for a crowd, keeps well in the fridge, and is a supremely sneaky way to get kids to eat veggies. Call me James Bond, because I’ve managed to hide a whole head of cauliflower and two summer squash in this dish. Don’t believe it? It’s all camouflage. Cauliflower is white so it blends in well with the pasta, especially when cut to about the same size as whatever pasta you use. Summer squash is yellow, but all you have to do is roast it, puree it, and add it to the cheese sauce for it’s healthy goodness to go completely unnoticed by your more picky eaters. I also add Italian sausage to the dish so it really is your grain, protein, and vegetable all in one place, but you can easily use ground beef, ground turkey, or omit meat altogether for a vegetarian option. Meat or no-meat, this is a wonderful way to get lots of good stuff into your belly in a deliciously cheese package! Line 2 baking sheets with parchment paper. Put the halved squash on one sheet. Drizzle with olive oil and sprinkle with salt. Toss cauliflower with olive oil, salt, and pepper and distribute evenly on the second baking sheet. Roast the squash for about 20 min or until soft, remove from oven. Continue roasting cauliflower for an additional 10 minutes or until soft and lightly browned in spots. Par cook pasta in a large pot per box instructions until cooked but firm. It should still have a bite to it. Drain the pasta, rinse in cold water, toss with about 1 tbsp of olive and return to the pot. Puree squash in a food processor or blender. Set aside. Toss cooked cauliflower and sausage (if you’re using it) in with the pasta until combined. Combine cheese into one bowl. Melt 2 tbsp butter in a medium saucepan over medium/low heat. When it begins to bubble, whisk in the flour. Continue to whisk for 2-3 minutes or until it turns a light caramel color. Pour in 2 cups of milk, whisking constantly. Turn up the heat to medium. Whisk while gradually adding the cheese, reserving 1.5 cups. Continue stirring until smooth, season and take off of the heat. Pour cheese sauce over the pasta mixture and stir to mix. Grease a large baking dish with the remaining tablespoon of butter. Pour pasta mixture into the baking dish. Top with reserved cheese and bake for 15-20 minutes or until it begins to brown. Turn oven to broil for 3-4 minutes or until the top of the pasta is golden brown and bubbly. Remove from oven and serve with a big salad!